Douglas Stephen Parker (Doug) was born in 1930 in Padstow, NSW Australia. His mother was born and grew up in Cudgegong in the Mudgee District. When she was a young lady, Doug's father was jackarooing (station hand for cattle) on a property nearby. They met and fell in love. When he returned from World War I, they married and had five children. Doug was the youngest of four sons and one daughter. Doug's family was active in the Episcopalian church, which is called the Anglican church in Australia and the Church of England in Britain. When Doug was 6 or 7 years old and the family was living at Kogarah, NSW, about 10 miles from Sydney, workers knocked on the Parker's door. The workers asked Doug’s mother if she remembered them. She did. She had attended a mission that was conducted by Jack Craig and Jack Annand when she was just a young lady. Now twenty years later, they had tracked her down again. The workers invited the Parkers to their nearest house church. Doug's parents, his brother Gordon, his sister Jean and Doug all professed. Doug and his brother Gordon were baptised at a dam at Wattamondara, just out of Cowra. The Sunday morning meeting was held in their home and his father was the local elder/bishop. They attended conventions at Guildford or Wattamondara. The Parkers moved back to Padstow. The family had a butcher shop and Doug learned the trade. When Doug was in his teens, he went to sea as a ship’s butcher. While he was on leave, he would stay with relatives in Scotland and Ireland. After Doug moved away from home, he owned a news agency and was also a building contractor in Australia. One time he narrowly escaped losing his life when an overloaded brick scaffold collapsed, and Doug was thrown under a wheelbarrow which protected him while thousands of bricks fell on top of him. He was bruised but not injured and badly shaken. Doug viewed it as a miracle and believed God had spared his life for a purpose. John Hardie made it clear that all Doug's wealth had to be given to the "the poor" who, in this instance, was John Hardie or the workers. With faith in Mr. Hardie, Doug offered him: (a) the capital return from the sale of his assets; or (b) signing over of all assets into a trust, whereby the income from rents, etc., would be paid, and then circulated among the workers. The latter appealed to Mr. Hardie. It was decided that Doug's going out into the work could wait until after the conventions of 1954. Doug went to visit his brother who had a small farm near Bega, at Quaama. This brother and his eldest brother had remained Anglicans. While there, the Anglican minister came to visit his brother, and Doug told him of his plans to enter the work. He explained that they held meetings in homes and the preachers went out in twos. Doug had never heard the name "Cooneyites," and replied they didn't have a name; that they went right back to Christ. Doug was shocked because he had always believed that everything outside this church was false, and that it was God's Only Way. That it had no founder--and it went all the way back to Christ. He was especially disturbed because he had just sold and sacrificed a business he really cared about. Feeling indebted to his parents, Doug decided to give them a holiday abroad before he entered the work. His father hadn’t seen his relatives since World War I when he was wounded in France and on Gallipoli. He had long wanted to revisit The Somme [Battle of Somme, France], Ypres [a Belgian municipality] and other places. His uncle had been a stretcher bearer in the War on The Somme and had lost an arm. So before he entered the work Doug wanted to take them at his expense to visit these places and relatives in Ireland and Britain again that they longed to see. Doug informed John Hardie that he needed a break before going out into the Work and told him of his plans to take his parents and uncle to visit relatives in Britain. Mr. Hardie replied adamantly, “You CANNOT go to Ireland. I don’t mind if your mother and father go, but you can’t go. Once you put your hand to the plow, you can never turn back. And you cannot go to Ireland." The workers pressured both his parents to keep Doug from going, and said the meeting would be taken out of their home if Doug went. His mother was beside herself with the stress of this threat and nearly had a nervous break down. Eventually, Doug's father told John Hardie and Gordon McNabb he no longer wanted the meeting in his home; didn't want to see them at his house again; that there was no compassion in them and they were not true followers of Christ. The friends were not told the real reason Doug didn't go in the work. They heard that Doug wasn't willing to sacrifice his money. The Parker family was shunned. Some of their friends refused to speak to them when they met. Some crossed to the other side of the street when they saw them coming their way. They wouldn't let the Parkers get near them or inside their homes. They had booked their ship passages and so they departed. On the way, they called on professing people in Britain and other places and were surprised when they refused to see them. The workers had sent instructions ahead that all doors were to be closed to them. The word was that "The serpent had taken charge of Doug and he was a very dangerous man." Doug was 24 when he arrived in Britain and he quietly went about on his own researching the Cooneyites without his parents' knowledge. He had nothing to go on except the name “Cooneyites.” He searched for weeks in libraries in Britain and failed to find anything. 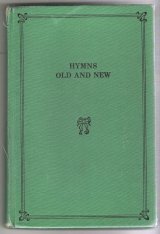 Finally, he came across a very small little booklet called The Cooneyites Or “Go-Preachers” And Their Doctrines by W. M. Rule. An uncle in Glasgow recommended Doug talk to the principal of the Methodist College, Dr. Norman Snaith, who was to speak at his church that Sunday. Doug described to the minister the church in which he had been involved without using the name “Cooneyites." The minister told Doug they were the Cooneyites and he'd encountered them many times; that they started in Ireland. He suggested Doug go to Enniskillen in County Fermanagh, Ireland. Doug followed his advice. Doug started with the newspaper in Enniskillen which was called the Impartial Reporter and Farmers’ Journal. It had a wide circulation in County Fermanagh. Mervyn Dane* was a reporter there and the editor was Wm. C. Trimble. ** They told Doug he could sit in a certain room and review all the papers he cared to. There were volumes back into the past century. After hours of sifting through the years, he finally came across the names of Edward Cooney, William Irvine, George Walker. He read accounts of the early conventions held right there in Co. Fermanagh at a place called "Crocknacrieve." The newspapers told how the preachers left from Crocknacrieve Convention to go preach in Australia, America, and other foreign lands. The Crocknacrieve Convention was held on the property of John West and his wife, Sara, and their daughter, Ida. During the convention in July every year, beginning with the inaugural convention in 1904, the Impartial Reporter reported details of the Crocknacrieve convention in their newspaper. It was quite a shock to Doug to read familiar names of workers in Australia, such as William (Bill) Carroll, John Hardie and Wilson McClung He was overwhelmed and in his own words, he "wept when he realized they had been conned and taken in. That this movement didn’t go back to Christ. That this movement only went back to the beginning of this century when these conventions just took on like wildfire, and there were thousands of people going to them…the property was called Crocknacrieve." There was no longer any doubt in Doug's mind that the Cooneyites were the same movement he had grown up in; and that John Hardie had hidden all the early history. Now he knew why Mr. Hardie was so anxious for him not to go to Ireland. He had a lot to cover up. He had led thousands to believe that his church went right back to Christ--when it was only a little over 50 years old! Doug called it "spiritual fraud." While Doug was visiting his cousins in Ireland, he met a number of early workers and others who had been put out of the sect or left--George Beattie, Alfred Magowan, Fred Wood, Ida West. He heard about the Division of 1928 when they excommunicated Ed Cooney. He went to Kilsyth, Scotland, the home of Wm. Irvine and visited some of his relatives. He met Peter Comrie, who had married Wm. Irvine's sister Jane, called Jeannie [Click Here for Irvine Family Genealogy]; and also a cousin who furnished him with some photos and letters of William Irvine and Archie, William's illegitimate son. On his way home, he went through America where he visited Irvine Weir in Boston, one of the three first workers who came to America in 1903. He met with Earl and Mae Earl Hammond in New York; met Edgar and Olga Hawkins in Detroit. 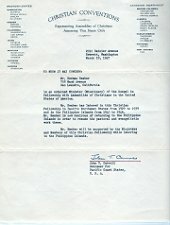 Olga had written the Selective Service and received a copy of George Walker's 1942 letter to them. He went to the West Coast and in Los Angeles he visited Ted and Kay Arvig who supported so much of his investigation; to Portland where he met one of the original workers and a cousin of Wm. Irvine, Willie Clelland; to Seattle where he met Ralph Derkland; to White Rock, Canada where he met quite a few more. These contacts provided him with letters, photographs and documents. After Doug returned to Australia he continued his research there. He went to South Australia and met with Ron Campbell and Arthur McCoy, who had been put out of the work. He looked up Jack Annand. He listened to their stories and they gave him more documents and letters. By this time (around 1953), Doug decided to confront John Hardie at the Guildford NSW convention. He took with him his brother in law and also a newspaper reporter. In front of a number of other friends and workers, Doug informed Mr. Hardie that he had misled Doug and his family by saying this sect went right back to Christ, and that it had no founder other than Christ. And by saying that it had never been called the “Cooneyites." Doug showed him a photograph of several young men on a mission trip of Scotland, including William Irvine, George Walker, Bill Carroll. Mr. Hardie confirmed that he was in the picture beside William Irvine. The Parkers…"went back to their Church of England's pastor and apologized, and to their amazement were received back with no condemnation from either the people in the Church of England or the pastor. In fact, the pastor told them he had thought they were still doing a good work helping out a poor little sister church, and he had never been aware of their false accusations about him and the Church of England church. I heard this from the lips of both Doug and his two parents." 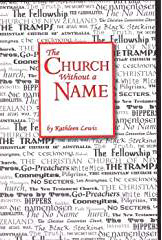 (Kay Arvig Downs) Note: The Church of England is also called the Anglican Church. After the confrontation with John Hardie at Guildford 1953 or 1954, Doug was immediately vilified to all friends and workers. He decided to put all the information together and write an exposé. Originally, he put it all together to try to defend himself largely because of all the wretched rumors that went out; e.g. “Oh, he never entered the work because he wasn’t prepared to make the sacrifice.” He also hoped to sow some seeds of truth. He felt he couldn’t keep the information to himself--it was truth--he had to get it out to others. In 1954, when he was about 25 years old, Doug printed a pamphlet he wrote, titled “A Spiritual Fraud Exposed.” There were two editions printed. It is not known if the second editions was a revision or the same as the first. Olga Hawkins, Kay Arvig and some others helped send out a mass mailing all in the same week to hundreds of friends and workers in the USA and Australia. The information contained in the pamphlet generated an exodus. After A Spiritual Fraud Exposed was distributed around the world in 1954, Doug was ready to settle down and enjoy and grow in his Christian faith. He studied at Moore Theological College from 1956 to 1958, a nearby Anglican college in Sydney, where he first came to an understanding of the true Christian faith – the gospel of grace. He became an Anglican minister in various Anglican churches in country areas. He also did some chaplaincy at a large prison and for hospitals. Doug and Helen Burgess were married sometime between 1954 and 1962. They had 3 children, two sons and a daughter. For several years, Doug went on with his life with little contact with the 2x2 sect. Through the years, however, many encouraged Doug to enlarge on his pamphlet, A Spiritual Fraud Exposed, and make it into a proper book. Doug told the story of his investigation to Dr. James I. Packer, a world renowned theologian who was fascinated. Dr. Packer insisted that Doug must write a book, offered his help and supplied valuable assistance. Another man who gave the Parkers a great deal of assistance was Brian Ronald Wilson (1926-2004), one of the world's leading sociologists of religion. Some 25 years after he left the sect, Doug took his Long Service Leave from work. He and his family temporarily moved to London, England, rented a house and laboriously researched. Helen's librarian skills were extremely valuable. They used various libraries in the U.K., interviewed people, recorded their statements, obtained copies of documents, etc. They compiled a book titled The Secret Sect which was privately published in 1982 by Macarthur Press (Books) Pty. Ltd., Sydney, Australia. Doug was 52 years old. Dr. Packer wrote the Forward to the book. In June of 1983, The Secret Sect made its public debut in the United States in some newspapers in cities near where some large conventions were taking place in Washington, Idaho and Los Angeles. These articles supplied details about the history of the sect and told where Parkers' newly printed book The Secret Sect could be purchased. 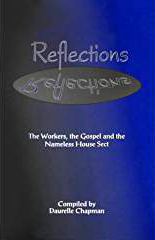 They provided viewpoints of the sect's friends and workers, as well as those of former members. From about 1985 to 1995, Doug was a hospital chaplain in a number of hospitals in the Illawarra District, south of Sydney. When he retired at age 65 in 1995, he and Helen moved to Vincentia, NSW Australia. They moved to Toowoomba, Queensland for a few years before moving back to Vincentia again. Doug passed away April 16, 2014. His parents, a son and all his siblings predeceased him. 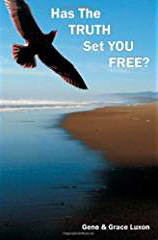 The Secret Sect book has changed countless lives. Many are extremely grateful to Doug and Helen for their tenacity and diligence in completing this project and for revealing the 2x2 sect's history as it really happened. Their laborious research, carefully documented and referenced with copious footnotes, has provided irrefutable evidence for future generations about the founding and development of the two by two ministry of the friends and workers. The Secret Sect book may be ordered in Australia from: Koorong Books--only available while stock lasts. (ISBN 0-9593398-0-9) The book is out of print and is not available in other countries. Right up until his death, Doug and Helen were working on revisions to The Secret Sect for its next printing. *Mervyn Dane has retired as Editor of the Imkpartial Reporter newspaper. He gave the Author a splendid tour of Enniskillen in July 2004. Mr. Dane had relatives in the 2x2 fellowship, and was a cousin to the late Patricia Roberts, author of several books about Edward Cooney. Compiled by Cherie Kropp. Besides the Bible, The Secret Sect is the book that has had the most impact on my life. I will be forever grateful to the Parkers for writing it, as are many others.